‘Executions of the Third of May’, on first appearance strikes quite a different tone. It could seem flagrantly propagandising. The composition strikes up an opposition between the Spaniards on the left, and the French troops on the right. The French troops’ faces are hidden, all we can see is their uniform, and their uniformity of pose. They are ranked precisely, robotic and machine like as they unwaveringly face their task. The Spaniards are varied in pose and appearance, individualised characters, clearly a rather disorganised gang, made up of young and old men, even a priest is depicted lining up to be executed. We are thus given more of a sense of them as real people, compared to the French troops, who are reduced to identical slaves to their master Napoleon, which makes us empathise further with the Spaniards. Goya carefully controls light within the piece, as a way of directing the viewers’ emotions. Traditionally a symbol of the fight between good and evil, Goya contrasts areas of bright light with darkness, using the clever device of the large, square lantern to enforce a decisive dividing line between the two groups of figures. The Spaniards are brightly lit, the troops flung into darkness. The bar of the corner of the lantern marks this separation clearly on the ground for the viewer to see, thus allying the Spaniards with the forces of good, the troops with those of evil. There is no questioning the brutal injustice of the event depicted, a true event, as those suspected of taking part in the resistance attack of the previous day were summarily executed. However this good vs. Evil message seems a little simple for Goya, particularly when compared with the aquatint prints he was still producing at the time. Many have pointed to the Christ-like pose and great proportions of the main Spanish figure as showing Goya’s trying to use traditional religious imagery (we can even see specks of blood on his palms) to encourage the viewer to sympathise with the Spaniards. The main figure is kneeling, were he to stand he would tower over the others. This sacrifice of his own life despite his superiority has clear religious parallels. This is certainly a valid interpretation, as I believe Goya intended it to be. But he has also cleverly women in his own ideas in relation to this even, going beyond this black and white interpretation. We have seen that Goya uses various devices to emphasise the ‘good vs. Evil’ message, specific to the fight between the Spaniards and the French troops. But within this framework he has inlaid a darker, universal message about human nature, and man’s treatment of fellow human beings, more characteristic of his work. A general tone of futility is set up through his use of composition and subtle symbolism. The composition hems in the viewer, thrusting us right into the action, close to the figures. 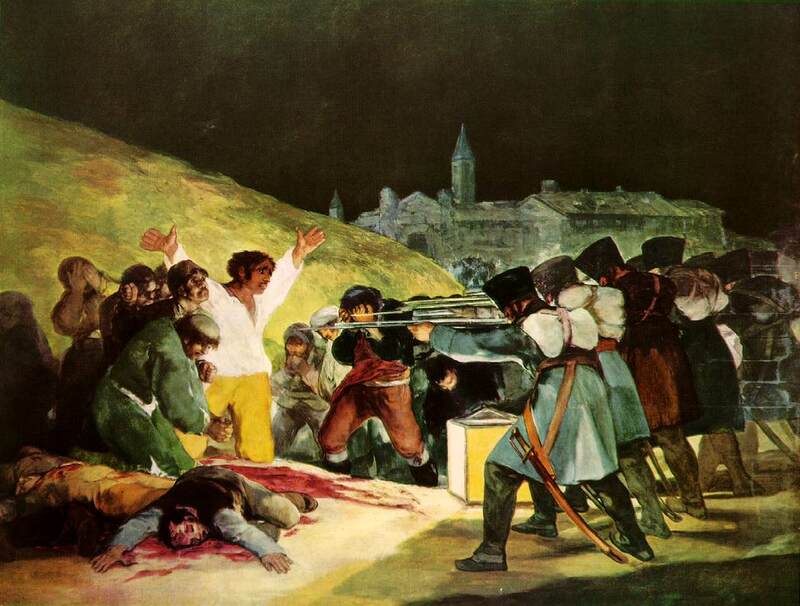 In order to achieve this Goya departs from reality – the gunmen are far closer than they would really have been, firing at such close range would have been a very messy business. This reminds us that Goya did not witness the event, he is recreating a story he has been told. The painting is on a large scale, but the action is packed tightly within it, so there is a sense almost of a condensing of emotions. The scene took place on the outskirts of Madrid, which we see opening out behind the troops. 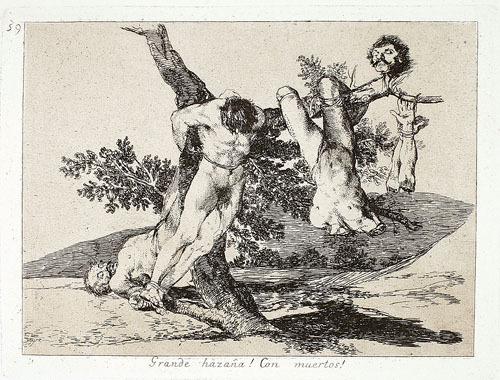 However behind the Spaniards Goya has enclosed the space, introducing a boulder or hillock, which stops the viewer from being able to look beyond, forcing them to focus on the execution itself. The Spanish figures form a clear pattern of those awaiting execution, those being executed, and those lying dead on the ground. Those waiting are on a lower level than those being shot. Alongside the great proportions of the main figure, this creates a sense of continuation: the figures start low, rise up, and are finally cut down. This gives the scene a sense of inevitability. This presents a two-fold idea: that this individual fate is inescapable, but also a broader idea of the inevitability of death. People grow, come to prime, and are then cut down, in an endless cycle, regardless of their achievements in life. Within this rather bleak message Goya includes the futility of religious faith. The Spanish figures, as we have seen, are brightly lit, but the sky above is pitch black, devoid of light and any sign of hope. There is no moon or starlight to symbolise the life beyond, and religious redemption. Behind the troops, there is a church tower rising up through the city, but this too seems devoid of hope, windows dark, the building almost overwhelmed by the larger buildings in front of it. More immediate than this is the effect of seeing priests and monks among those who away execution, bent over in anguish, apparently finding no consolation in their faith. He thus points to the hopelessness of man’s situation, particularly in times of war, and inability to come to terms with their brutality towards one another. This painting can almost be seen as an expression of loss of faith when faced with the grotesque realities of war, and the irreconcilable divide between faith and war-time actions (although for Goya though this loss of faith may have occurred far earlier, with his period of serious illness, if he had ever been a particularly religious man). Goya’s experience as a court painter could be seen as the basis for this clever interweaving of propagandising elements with darker, more sinister tones. It was his duty to paint positive representations of the Royal family and their court, but it is often noted that whilst doing so he manages to depict the sense of unease and corruption that surrounded them. 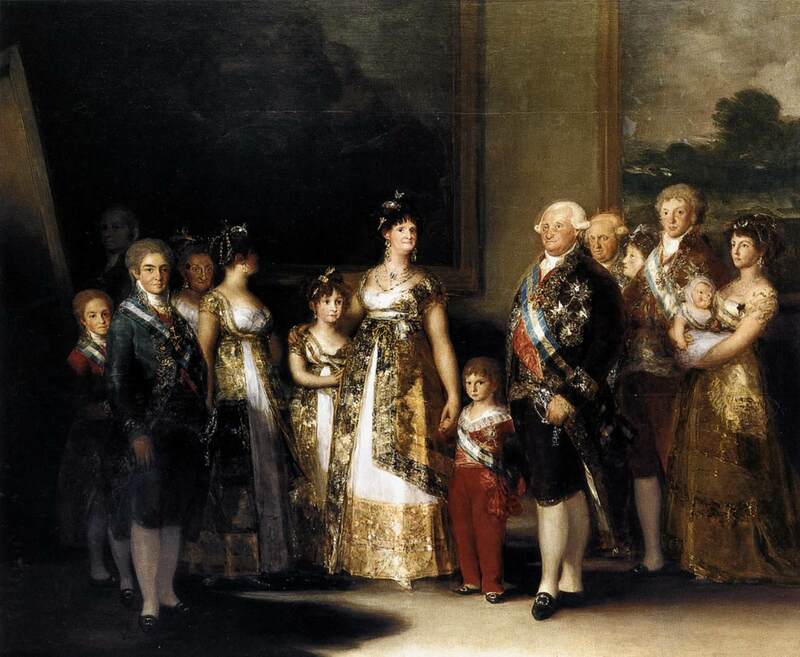 ‘Charles IV of Spain and His Family’ (1800) is a notable example, wherein the weakness of the king is presented through his wife’s dominance in the centre of the composition, and each figure is pictured with a largely distrusting or irritated expression. One girl turns her head absent-mindedly, paying little heed to the painter, looking away behind her. To our eyes it would be hard to believe, but portraits such as this earned Goya his good reputation; and he went on to receive commissions from prominent members of the Spanish aristocracy including the Duke of Medina Sidonia and the Duchess of Alba (families familiar to any who have studied Spanish early modern history). So he quite clearly succeeded in fulfilling his brief as well as adding an element of his own opinions. He has applied this same process to the creation of ‘The Executions of the Third of May, 1808’. In conjunction with the ‘Second of May, 1808’, the piece glorifies the heroic efforts of the Spanish to escape from the stranglehold of French occupations (although we must note that ‘Second of May’ depicts Spaniards fighting mercenaries hired by the French, predominantly ‘Mamluk’ cavalry), and the ultimate sacrifice they paid for this bravery. This message allies with that the interim government would have wished to put across. Alongside this, Goya puts across his own, more cynical message, about the essential waste of human life and the hopelessness of faith. It is this intertwining of message, the clear and relatively comfortable, with the subtler, sinister one, which makes this piece typical of Goya’s work, and which has made it such an enduring image of war and its atrocities. I’m terribly sorry but I cannot read Spanish! Translation wild be much appreciated! Thank you! “Afrancesado” should be traduced as “French-shaped-person”. Somebody with french ideas of how to run the state or the goberment. A dangerous way of thinking during the war. I mean, you could be killed by your own people (Similar to some French artist during german occupation, the same dilema). This man got two “faces”: the spaniard who suffers the pain of common people (remember, you’ll never see a noble or high-class person, fighting, dying or being tortured or executed on his war pictures. Unkown heroes and simple humans, no Lords). And his second face: the “political traitor”. It sounds hard. But his mind is with french system. It will cause him troubles the rest of his life (friends will try to protect him with less success), and will die in France. And thus, we get the word that describes the man: grief. All his war pictures have a taste of useless effort. More than propaganda, you feel a bitter sense, that spaniards are so criminal as french people. The same kind of beast ¿don’t you feel it in his war paintings? You don’t see flags or brilliant uniforms, only people killing and dying with no great differences in appereance (sometimes, even imperial soldiers look as raggy beggars, poor people beeing used). At the end, useless is the message. As his own life: an useless effort to change his country. I like your comentary, it’s quite exact, but I could’t resist to (or hold, I don`t know how you say), … to add my own. Two only things: Don`t be “terribly sorry” for not reading Spanish. An only “sorry” is enought (my English is orthopedic too). And second, don’t try to give religion more importance than it really has on Spain or european catholic countries. Catholic Religion is sometimes as a theater. And only a theater that may help you lying yourself. I know people who pay taxes marking the x for Catholic Church, even they are conviced that there’s no more after. Me myself. 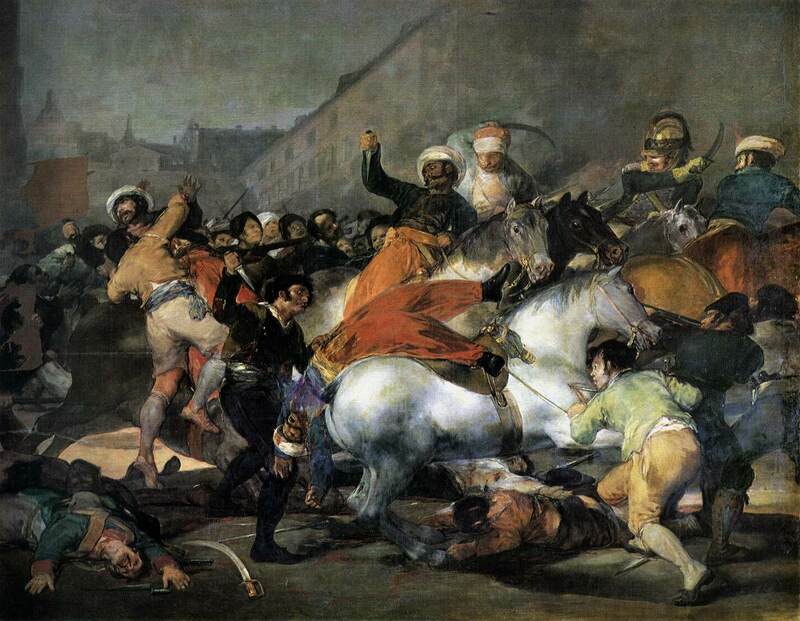 Spain is a less believer society than you can imagine, and I think Goya too. I don’t see Goya as a religious person. That’s only my opinion. Wow, thank you! You make some really interesting points that truly would not have occurred to me. I can’t say I’ve done a great deal of research into Goya’s overall output, thank you for the biographical information. I don’t see him as a religious person either, although as an outsider to Spanish culture, I have perhaps over-emphasised the significance of his symbolism’s negative representation of the church. The only period of Spanish history I have studied in detail is the reign of Philip II, so you see why I have come to think of it as such a major factor! Thank you very much for commenting your interpretation, discussion is great, and I feel that my understanding of the piece has been broadened. “Although we must note that ‘Second of May’ depicts Spaniards fighting mercenaries hired by the French, predominantly Turkish ‘Mamluk’ cavalry”. Mamluk are not Turkish. Ottoman empire was also in war with France and ottomans kicked the France army out of northern Africa. Ottomans or Turks were never hired by French. Your information is not right. Thanks for this. I’ve amended accordingly. The definition of a ‘mamluk’ can be rather confusing as they have a long history of interaction with both France and the Ottoman Empire, but as you say, I think it’s correct that these are not Turkish.